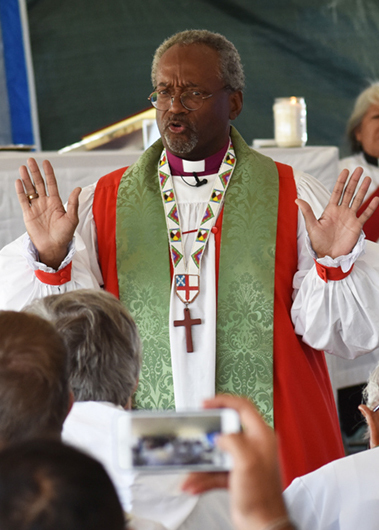 [Episcopal News Service] Episcopal Church Presiding Bishop Michael Curry, citing behavior that “may threaten the good order and welfare of the Church,” has taken disciplinary action against Los Angeles Bishop J. Jon Bruno while a disciplinary panel weighs whether to punish Bruno further over his role in a failed land sale. The full statement is posted here. Curry placed a “partial restriction on the ministry of a bishop,” meaning the Los Angeles bishop is forbidden from taking any action related to the property of the congregation in question, St. James the Great Episcopal Church in Newport Beach, California. The presiding bishop’s action against Bruno comes as the lead attorney in the pending disciplinary case filed a brief calling for the bishop to be deposed from his ministry and for a more thorough investigation into potential misconduct. The original case against Bruno involves his unsuccessful 2015 attempt to sell the Newport Beach church to a condominium developer for $15 million in cash. That effort prompted the members of St. James to bring misconduct allegations against Bruno, alleging he violated Church law. Hearings on those allegations where held in March. “In recent days, I have learned of actions that, in my view, may threaten the good order and welfare of the Church,” Curry said, adding the restriction on Bruno is effective immediately. St. James was one of four properties that the diocese spent close to $10 million in litigation to recover from disaffiliated Episcopalians who broke with the Episcopal Church over its policies on women’s ordination and the full inclusion of LGBTQ members in the life of the Church, including ordained ministry. Diocese of Los Angeles Chancellor Richard Zevnik and Vice Chancellor Julie Dean Larsen have asked the panel to dismiss the entire case against Bruno. They have said that a “civil lawsuit, political actions and social media campaign” mounted by members of St. James the Great were “wrongfully, but successfully and strategically, designed to stop the sale of [the] 40,000-square foot church property” on what is known as Lido Island, a prosperous housing development sporting a yacht club. 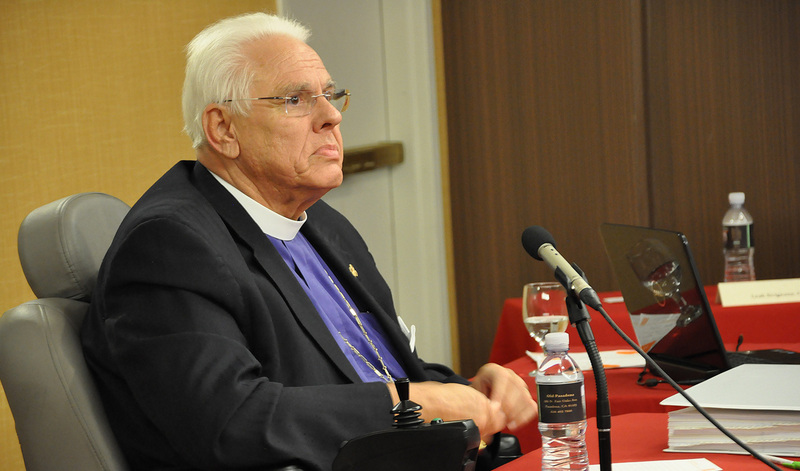 Bruno turns 72, the Episcopal Church’s mandatory retirement age, in late 2018. Incoming Bishop Coadjutor John Taylor, his successor, is scheduled to be ordained and consecrated on July 8. – David Paulsen is an editor and reporter for the Episcopal News Service. He can be reached at dpaulsen@episcopalchurch.org. Episcopal News Service’s Mary Frances Schjonberg contributed to this report. I’m having a hard time understanding why the congregation of St. James can’t continue to worship in their building until all of this is resolved. And, of course, I didn’t understand from the beginning how a bishop can just sell a church property because he feels like it. Doesn’t church property belong to the diocese? In California, and in particular the Diocese of Los Angeles, the Bishop holds some property as a Corporation Sole. He alone makes the decisions about property held as Corporation Sole. That is what is at the center of this whole thing. This is different from property owned by a church and for which the so-called Dennis canon applies. Now the Presiding Bishop has placed a restriction on the Bishop’s ministry that specifically includes his role as Corporation Sole in the matter of selling the Saint James the Great property. Yes, it is all very confusing and is unique to states, and dioceses, whose Bishops can act as a Corporation Sole. Where is the Standing Committee in all this? When I was on the Diocese of Washington’s standing committee in rhe 1990’s property could not be sold, bought or encumbered with debt without standing committee approval. So, was he going to keep the money? How odd! Bhp Bruno was not going to keep the money. That isn’t the way it works. As to the presiding bishop perhaps he should be investigated a bit more thoroughly. Bhp. Bruno has been an exemplary bishop and clergyman for many years. He has kept the Diocese of Los Angeles intact through all the changes and has been a wise bishop. People seem to want to condemn this man without understanding how properties are held in this diocese. He has been through enough. God bless and protect Bhp. Bruno. At the same time the Bishop lied to people about what was going on. Seems to me that we have a rule about not bearing false witness? Sometimes people in power become too accustomed to having power. This can lead to going about trying to do things that might be good for an organization in the long run, while harming it in the short run. From what I read the Bishop wanted too leave the diocese on a solid financial footing. He may have felt constrained by his upcoming retirement, which led to his untruthful behavior. People don’t like being lied to. If a liar comes clean and repents, most people can find a way to forgive. What they do not forgive is an unrepentant liar who attempts to quash all efforts to bring out the truth. That is what has happened here. I have had the pleasure (not) of having the Bishop yell and intimidate at another church in the diocese. He wanted us (new members of the church to fully understand our obligation to contribute a percentage of our income to the church. He literally made 1/3 of the church move so that we were facing him directly and he would not have to move his body to face in our direction. While I love the Reverend of this church, I found Bruno CAUSTIC to the extreme. We, my husband felt bullied and signed the forms and attempted to keep up with the demanded payments. Our membership with the church is on hold. I think once he is gone I will breath a sigh of relief. I have gotten to know Bishop John Taylor and he is the kindest most loving human–truly a humble man who uses his hands and feet to do the work of Jesus in a manner I have rarely observed. Please let Bruno go. I’m sure my lone voice does not count for much, but I do not think he is a man of Christ. i think he is a man of money and legacy and revenge. If someone has been a good person all their life and then goes out and kills someone, does that person deserve a pass? Bruno is a bully and needs to win! There is something wrong with this man! Jennings’ comments here are irrelevant. Bruno acted in a manner that is shameful, corporation sole or not. He wanted money for the diocese at the expense of a parish. This is yet another slam in the face of this faltering church. That is your opinion attached to your agenda. Review “Corporation Sole” and then make an educated commentary. How is it you can read the mind of someone and what they were pursuing and what the motives were? Lurline: One motivation that is entirely obvious is that Bishop Bruno believes that it is right to deceive those around him. The reason will become apparent in due course. Whether a Corporation Sole or the tension within the Dennis Canon one wonders why a congregation would bother to plant flowers, buy paint, donate windows, buy supplies, and on and on only for some mysterious authority to suddenly pronounce that it is no longer theirs – something to be juggled and taken away for some “greater good”. What greater good does an ecclesiastical authority have other than growing the local congregation? This way of relating to a congregation is absolutely medieval and may be one of many reasons why our Average Sunday Attendance is auguring deeper into the ground and is now down to about 550,000. If people feel disposable they will self-dispose to some better situation. F.Y.I. St. James the Great was not a parish but a mission congregation. As a mission congregation the Bishop is the Rector albeit they have a vicar who performs the day to day tasks as locum tenons The mission is one of a select few congregations who are under Corporation Sole. Mission congregations are treated differently than sustainable parishes. They can be closed at any time at the discretion of the Standing Committee and the Bishop. Mission congregations are supported by the MSF (Mission Share Fund) when your parish gives its monthly pledge to the diocese a portion of the money goes to support missions. In this case St. James was under Corporation Sole not included in the support from the MSF. Remember the Diocese of Los Angeles has spent millions of dollars in litigation over the parishes who left the church. The Diocese holds the deeds to all properties . Corporation sole is one of the trickiest thing to wrap one’s self around. Please do your research before venting in a public forum. The corporation sole has specific purposes. The Diocese created it. On the other hand, confidentiality has significant meaning and purposes, many if not all of which appear to have been breached by a carefully crafted and entirely inappropriate social media campaign. I am not particularly proud of the people of St. James, but I love them anyway. I understand their distress, if not their tactics. This is an unfortunate situation and one that needs to be fully investigated. In respect for Bishop Bruno as well as our Presiding Bishop Curry, I believe that erring on the side of caution is probably best. We need to wait for a full report. Obviously, in any situation of this magnitude, there will be things we will learn. And, there will confidential information that will not be shared. Confidentiality, in this situation = COVERUP FOR WRONGDOING! Indeed Blessings to you dear Lurline Jennings for speaking up/out — Bishop Bruno has been a role model for all of us for Justice, Peace, equality–the core of our Baptismal Covenant, notable in the turmoil of the Israeli-Palestinian issue for some 70 years–he has always taken spiritual leadership in support of the Diocese of Jerusalem when other bishops have not had that strength of moral/ethical leadership…certainly the Smocks in LA diocese can readily vouch for that critical support). One does wonder how our current PB Curry can make such an indictment when he is relatively “new on the international neighborhood relative to the middle east”–yes how many times/how often has he been to the Diocese of Jerusalem to voice/support Bishop Dawani in that extremely difficult spiritual leadershp? Yes, a role model…for arrogance and dishonesty. OK. The Corporation Sole is the bishop. He can only act as Corp Sole as long as he is the bishop. If his powers are put under restriction by the church, then he is bound by the ordination oath he has signed 3 times (deacon, priest, and bishop ordinations) to obey that restriction. He is also bound by the Dennis Canon. The Canon does not say anything about the technical way a title for church property runs. It does say that all church property held by or for the use of a parish is held in trust for the Diocese and the whole Episcopal Church. That would cover Corp Sole ownership as well as title running in the name of Trustees, of a Diocesan corporation, a parish corporation, or a parish. The testimony and depositions show Bruno acted in bad faith with this mission parish. If he was rector, he was not a dutiful rector because he claimed his actions were based on financial information over a year old. A dutiful rector would make sure he was acting on up-to-date information. The parish was on track to be FULLY self-sufficient within six months of when he announced the sale. He claimed that the parish was unsustainable in part because it lacked parking, but he had refused to sign a parking lease that would have solved the issue. When the Vicar in charge emailed him asking if a sale was being contemplated shortly, because she had heard rumors about a sale, he did not answer her email and defended his position saying he couldn’t be expected to answer every email from a clergy person. REALLY? When a vicar serving under him asks a question directly related to her (his) charge, it’s not a random email. He at first assured the parish that they could temporarily occupy the building after the sale, then locked them out without warning, not even giving them time for employees to remove personal items from their desks. Tenants were locked out from the equipment they used to conduct business. When he then assured the congregation that they could continue to be a church without walls, he closed the parish without ever giving it notice.. This latest attempt to sell by stealth the property while a church hearing Panel was working on its decision showed great contempt. Bruno may have been a good bishop in many ways, but something has happened, and this is so far out of the range of decency and pastoral care as to wonder about his mental health.